We ask our readers to also write to International Education, a global federation of about 400 unions in more than 170 countries and territories representing 30 million teachers and education employees, and ask their support for persecuted teachers in Iran. You are welcome to use our letter as a template for your own. We are writing to you again to thank you and all of Education International once again for your earlier steadfast support for beloved Iranian teacher Farzad Kamangar. Together we struggled for his freedom and his life, and together we mourned the brutal injustice that took Farzad’s life. – Rasoul Bodaghi, a member of the board of directors of the Iranian Teachers Trade Association and a teacher for 21 years currently detained as a political prisoner in Gohardasht, suffered severe injuries to his head, face, and his teeth in prison last year when he was tied to the prison bars and repeatedly beaten (ref). The last news we have of Bodaghi was in May 2011 when he was put into solitary confinement for going on hunger strike; his physical condition was reported as extremely poor (ref). – On 5 August 2011, Siavash Eslami, member of the Board of Directors of Teachers Club in Sari, Iran and a teacher for 24 years, was subjected to 37 lashes and sentenced to a one year prison term upon his conviction for participating in the 2009 post-election marches (ref). – Over the weekend, we learned that the Islamic Republic has sent orders for the death sentence of high school teacher Abdolreza Ghanbari to be implemented (ref). 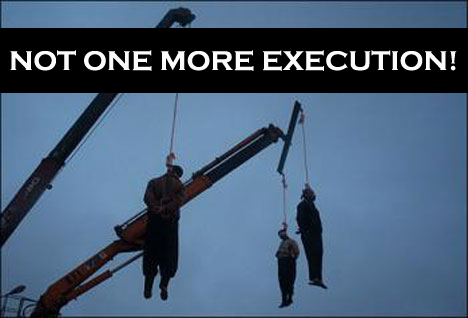 This means that Mr. Ghanbari can be executed at any moment. Mr. Ghanbari has been sentenced to death on charges of participating in the 2009 post-election protests, videotaping the demonstrations, and sending the videos to opposition groups (ref). We urgently request Education International’s ongoing support for teachers who continue to pay the highest price under the repressive regime in Iran. We urgently request that teachers worldwide condemn the lashings, beatings, and the executions of their colleagues in Iran. We hope that Education International will be able to continue its support for teachers facing the worst, most lethal forms of injustice in Iran. Your support for the struggle of teachers in Iran lends moral encouragement and solace in this time of great need.